Youth Empowered Action Camp is a life-changing camp for world-changing teens — now with a camp for adults! Thanks for your interest in YEA (rhymes with Hey!) Camp and making our world a better place! OK, we admit we’re biased, but YEA Camp really might be the most amazing place on the planet. Where else can you be surrounded by ridiculously nice people who want to change the world — and who want to do everything they can to help YOU make a huge difference too? Plus, it’s camp, so you know it’ll be fun! You can check out some of our staff bios below, you can read about Our Approach, or you can download our new e-book, The Beginner’s Guide to Changing the World, to learn more about our philosophy to making a difference on a social justice issue of your choice, and get more active yourself. In this guide, you will find interactive worksheets to reflect on your own passions and skills, video links with dozens of examples to help you get more involved, and introductory content to provide a solid foundation to take your change-making to new heights. YEA Camp was started by long-time activist and educator Nora Kramer, who recognized that when young people start looking around and learning about the problems in our world, they really want to do something to help. But sometimes they just don’t know what. That is not being taught in school. But it needs to be taught somewhere. Since 2009, Youth Empowered Action Camp has been running life-changing, ridiculously fun and inspiring camps across the country for progressive teens who want to do something about the problems they see in our world. YEA Camp is a fiscally sponsored 501(c)3 nonprofit project of Earth Island Institute, named by People Magazine as their top organization for people wanting to make a difference to support. Since 2009, YEA Camp has been running life-changing, ridiculously fun and inspiring camps across the country for progressive teens who want to do something about the problems they see in our world. Our team is not your typical summer camp counselors. Each year, we bring together a dedicated group of experienced activists, credentialed teachers, and community organizers on causes from climate change to racism, gay rights to animal rights. We have a ton of experience working on these causes and want to support you in making a difference too. Thanks to this incredible team, the nearly 500 campers who have gone through our programs commonly describe YEA Camp as one of the greatest experiences of their life. Our campers go on to do such inspiring things to make a difference — from starting school environmental clubs that improve recycling at school, to raising funds to help the homeless, to getting an internship with a favorite nonprofit. Many of them credit YEA Camp for their success. Our staff is all about positivity, empowerment, fun, and safety. And when we say safety, we mean it. Of course we mean physical safety, which is always our top priority. Parents, we have many years of collective camp experience and take our in loco parentis responsibility very seriously. Every staff member is thoroughly vetted, including a full criminal background check. But that’s just the bare minimum. When we say safety, we also mean emotional safety. As an empowerment program, YEA Camp is all about supporting our campers to change the world, which means creating an environment where everyone feels cared about and free to be themselves. In fact, our campers often describe YEA Camp as the safest space they’ve ever been in. We create an environment where even our shyest campers get comfortable going outside their comfort zone — and they know we’ll all be standing up and cheering for them when they do. The staff at YEA Camp is not your typical cast of camp counselors. Our team is composed of folks with teaching credentials, Master’s degrees, and expertise in youth development, as well as specialized and creative fields such as arts activism, grassroots outreach, politics, fundraising, yoga, anti-racism, animal protection, gay rights, food justice, and more, plus many years of experience both as peaceful activists for various causes and as educators. Note: Our list of staff below may not be updated for the current summer, depending on where we are in our hiring process, and most do not attend all sessions, so be aware that they may not be at your particular session of YEA Camp. These bios do give a sense of the caliber and type of staff we have at every session of YEA Camp. For more than 15 years, Nora Kramer has dedicated herself as an educator and activist to be a force for good. She has taught high school English, environmental education, at after-school programs, and — of course — at camps, where she is inspired by the idealism, silliness, honesty, and courage of young people. Nora has also worked tirelessly as an activist for a variety of progressive causes to address the many inequities in our world. From working on political campaigns to handing out tens of thousands of leaflets and collecting thousands of signatures, to writing letters, giving talks, and training new activists, you name it and she’s probably done a lot of it (though only peaceful stuff — and no, she’s never been arrested). Recognizing the need for teens to get training and support to become changemakers on causes they care about, Nora developed the idea and primary curriculum for YEA Camp and founded the camp in 2009. She loves this creative way to combine her obsession with activism and social change with her passion for working with youth, and spends all year preparing for summer. Nora presented on social justice education at the American Camp Association’s 2017 national conference and was recently a keynote speaker at the ACA’s Spring Leadership Conference. Nora received her teaching credential from San Francisco State University and has spent about half of the summers of her life at camp, both as a camper and working at and learning from 5 different camps across the country. She has been trained by the Institute For Humane Education, completed the intensive Basic Camp Director Course through the American Camp Association, has coached leadership programs with Landmark Education, done intensive trainings in anti-racism and nonviolent communication, was certified in nonviolent conflict resolution with youth through the Help Increase the Peace program, and completed her 200-Hour Yoga Teacher Training with It’s Yoga. YEA Camp’s unique curriculum is infused with learnings from these and many more social justice, activism, leadership, mindfulness, and personal development programs Nora has participated in. Laura has been an activist since age 14 and has been an educator for over 15 years. In college, she majored in Environmental Education at Oregon State University while teaching at various youth programs including outdoor school, nature centers, YMCA camps, and the Boys and Girls club. After college, she pursued her passion for making a difference by working for several nonprofits including the Public Interest Research Group (PIRG) in Connecticut, a non-profit organization that organizes students on issues of the environment and consumer advocacy; Farm Sanctuary, the premier national organization working on behalf of animals raised for food; and the Tompkins County Society for the Prevention of Cruelty to Animals, the national leader for the no-kill animal shelter movement. In 2006 she obtained her Masters in Education from Portland State University and a teaching license in middle and high school science and math. Laura was a teacher with Portland Public Schools for four years before joining YEA Camp full time in 2010. As a mother of two, she hopes to use her experience and love of working with young people to inspire the next generation to make a difference. Laura is passionate about addressing the climate crisis and serves as the volunteer Regional Coordinator for the Citizens Climate Lobby (CCL) for the Pacific Northwest, supporting CCL group leaders in OR, WA, ID, MT, AK and HI. She participates in the Salem CCL chapter. Laura has worked at 16(!) sessions of YEA Camp and was hugely instrumental in its development. She currently lives in Salem, Oregon. Aaron “Yosef” is a man who loves the jungle and anywhere all living beings can coexist and build (like at YEA Camp). Ironically, he grew up in Queens, New York and loves learning from his concrete jungle as well. Getting, giving back to, and just advocating for nature as a whole is his plot. Thus far he’s gotten the chance to work with different groups of people and organizations from brownfield remediation, building or helping out at local community gardens, getting his people back to nature or helping them transition to healthier and more eco-friendly lives, educating teens to “innerstand” and “overstand” issues they face in the inner city, raising awareness through music, feeding and clothing the homeless and park clean ups. Being a lover of the arts and participating in open mics, he has been inspired by others who are using their talents to raise awareness (including YEA Camp campers and staff) to do the same! Aaron also loves to research anything relevant to life like alternative medicine, natural history and science, law, botany, how to make your own soaps, and anything Steve Irwin or Ace Ventura would know. Aaron has spent 4 summers working at YEA Camp. Alice Ragland is a PhD student in the Multicultural and Equity Studies in Education program at The Ohio State University. Her research interests include racism in education, neoliberalism, and Black liberation movements. Alice is also a social justice educator and a long-time community activist and organizer. She has recently organized around issues of racial, environmental, and economic justice. Alice facilitates educational workshops for teens, educators, and the general public about racism, sexism, capitalism, imperialism, and critical media literacy. In addition to her academic and activist work, Alice writes poetry and creative nonfiction, and she contributes to Against The Current: A Socialist Journal. Andina Aste-Nieto grew up in two big, wonderful families in San Diego. Several of Andina‘s relations are social justice warriors and she grew up around conversations about oppression and justice for Chicano, American Indian, African-American, homeless, and LGBT communities. In Andina‘s twenties, she found ways to travel the world and stay connected to her passions for social justice and and working with youth. She visited and volunteered in orphanages and poor indigenous communities in Mexico and Guatemala. She attended the Working Group on Indigenous Peoples at the United Nations in Geneva, Switzerland. One of her most impactful experiences was conducting anthropological research about how resorts are affecting the environment and the Maya community in Tulum, Mexico. Between some of those adventures, Andina worked as a substitute teacher and teacher’s aide in both public and private schools in the U.S. Her desire to empower the students that are falling through the cracks of the public school system led her to the social justice-oriented multicultural counseling program that she is in currently. Her internship is at the Southern California American Indian Resource Center where she serves children, teens, and adults. Andina is supplementing her Western education with teachings about traditional indigenous healing ceremonies and practices. One of her dreams is to create a program where she can facilitate the empowerment of youth of color through connection to their cultural identity and roots. After noticing his school’s littering problem as a 12-year-old, Charles Orgbon III began leading school-based community beautification projects. He quickly realized that the environmental movement was not adequately supporting young environmental changemakers; therefore, he created Greening Forward. Today, six years later, the youth-driven, youth-imagined organization has grown into the largest movement of its kind. In all, Greening Forward has distributed over $40,000 in funding to youth environmental projects that have also planted over 300 trees, built over 80 compost bins, installed over 200 rain barrels, monitored 11 streams, recycled 120 tons of waste, planned two International Young Environmentalists Youth Summits, and advocated for a number of other environmental issues. The Children’s Museum of Indianapolis has dedicated a piece of the Power of Children permanent exhibit to Charles’s efforts in order to inspire more young people to make a positive difference in the world. Charles was a counselor at our New York session last year and we absolutely loved working with him. We hope, now that he has graduated from college, his schedule allows for him to work at YEA Camp in future summers. Chloe is currently a college student and the founder of a non-profit organization called Vegetarian and Vegan Youth (VegYouth). Chloe served on Mercy for Animals and Pollination Projects’ Youth Advisory Boards and was named the Humane League’s “Student of the Year.” She was a Corporate Policy intern at the Humane Society during Summer 2014. Chloe has contributed to One Green Planet and Our Hen House, and her work has been featured in the Charleston Gazette, Huffington Post, All Animals magazine, and various blogs. Aside from school-work and activism, Chloe has raced cross country, played flute orchestra, and worked at summer camps, including YEA Camp! Claire Tamburello is a student, passionate social justice/animal rights activist, and aspiring photographer and marine biologist. She became vegetarian at age 11 and vegan at age 12 with support from her family. At age 16, Claire organized and attended her town’s first ever circus protest. She’s participated in numerous animal rights campaigns, including End Circus Cruelty and Keep Michigan’s Wolves Protected. She’s attended many protests, leafleted in groups and solo, aided in farm sanctuary fundraisers, and been an active member of VegTeens, an organization bringing together vegetarian and vegan teens in Michigan. She regularly volunteers at animal shelters and various nonprofits. Currently, Claire is helping to plan a teens section of the Grand Rapids VegFest, organizing a local park cleanup, and planning a trick-or-treating Halloween event for young vegans. Claire was a camper last year and, as a standout activist this year, will be a fantastic role model for this year’s campers through her role as a counselor in training at our YEA Camp for Animal Advocates. Check out this profile we did on Claire for our YEA Camp Heroes campaign. Diana’s singing career began at the age of seven with the New York City Opera Children’s Chorus. For ten years she performed solo and ensemble roles with the company, while also collaborating on CD recordings such as The Trans Siberian Orchestra’s Christmas Eve and Other Stories, and with Paul Simon on his demo, The Capeman. She continued her studies at a performing arts high school and college, and performed for six years with the young artist program, Seagle Music Colony, and toured with their Educational Outreach Program to bring children’s opera to the community. She began holding private voice lessons as a freshman in college through the Community Music Program, which later blossomed to include varied elements such as combining music with social services, therapeutic healing for children and teens, the development of personal and emotional growth through music, all of which has culminated in the opening I Can Jam Studios. In addition to I Can Jam Studios LLC, Rachel currently accepted the position as Director of Colorado Arts Center Inc, a non-profit which houses small businesses and proprietors of every facet of the fine arts, set in the Arts District on Santa Fe. Diana brings her passion for music, love for people, commitment to social justice, and her huge heart to each session of YEA Camp. She has worked at YEA Camp for the past 3 summers and hopes to return next summer. Ida currently works as a tutor at a school in East Oakland and loves working with her sixth graders, especially when they draw her pictures of dragons or show her a dance they choreographed to a TLC song. Her passion for youth and social justice was sparked through volunteering as a youth leader at the Mosaic Project, an incredible organization that brings together disparate groups of kids to practice conflict resolution skills and embrace diversity. She is interested in creating a more peaceful world through healing interpersonal trauma with young people, particularly children of immigrant families (Ida herself moved to America from Russia and Israel when she was 7). Next year, she will begin her master’s program in Community Mental Health at the California Institute for Integral Studies. She also loves performing improv comedy and exploring nature. Kamekə is currently working with Farm Sanctuary as the Volunteer Program Coordinator at their location in Watkins Glen, New York. Her interest in social justice and activism began in high school when she was inspired by a quote by Marie Curie that said “…our particular duty [is] to aid those to whom we think we can be most useful.” From there her involvement in and passion for issues of justice evolved through experiences traveling the country and doing national service with a program called AmeriCorps National Civilian Community Corps (NCCC). She is currently pursuing a Master of Arts in Social Change (M.A.S.C.) degree at Starr King School for the Ministry in Berkeley and is passionate about exploring our creative power to bring about a more just and compassionate world. She’s also very passionate about loving on her canine best friend and soulmate, Chaz. Kamekə has been a counselor at YEA Camp for 2 sessions and is incredibly excited to learn from and connect with this amazing community of activists. Lacey Carlson is a student, activist, and aspiring environmental educator who is passionate about compassion. At age 14 she became vegan with support from her family, and has continuously worked since then to open her own eyes, and those of others, about animal rights, environmental sustainability, social justice, and the intersections of all three. In high school, she worked as a docent for the Woodcreek Nature Center, guiding nature walks and teaching children about the environment, and volunteered with Sacramento Vegan Community Challenge for many events such as Sacramento Vegan Chef Challenge and 1000 Vegan Cupcakes for Charity. She has participated in many animal advocacy campaigns and protests, including the UC Davis Primate Research Protest and the Humane Lobby Day, in her hometown of Sacramento, CA. She currently attends University of California, Santa Cruz as an Environmental Studies major, and is an intern with Life Lab!, a garden-based environmental education program that takes local elementary schools on field trips to teach them about connections between the food we eat and the world we live in. Madeleine is an animal rights activist and educator from the East Coast. She is currently a graduate student in the Smith College Master of Arts in Teaching Program and holds a B.A. in Philosophy from Smith College. Throughout high school and college, Madeleine has worked in special education, one-to-one tutoring, and Philosophy for Children programs, empowering kids to engage in critical thinking and ethical debate from an early age. She has facilitated Philosophy for Children programs with the Balmoral School in Auckland, New Zealand, Eurekamp in Alberta, Canada, the Pioneer Valley homeschooling group in Northampton, MA, and the Martin Luther King Jr. Charter School of Excellence in Springfield, MA. She is excited to learn more about bridging these experiences to more active work in the humane education movement. Madeleine has been involved in animal rights and environmental activism since before middle school, and has worked with Farm Sanctuary, the League of Humane Voters, and The Humane League. In 2012, Madeleine co-founded Animal Advocates of Smith College, and has also been active with the American Sign Language and Deaf Culture Club, Transcending Gender (a trans* students and allies campus group), and the House Sustainability Representatives. Vegetarian for most of her life and vegan since fourteen, Madeleine sees making vegan living more accessible to a wider demographic as a necessary step in moving away from the speciesism, racism, ableism, sexism and cissexism that pervades our society. 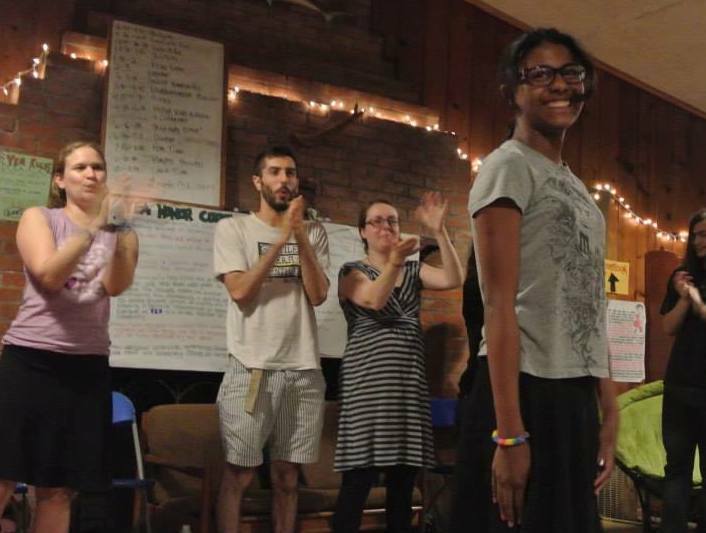 Madeleine is working to bring more intersectional awareness to her activism, and is thrilled to have the privilege to learn and grow with YEA Camp social justice community members of all ages and backgrounds. Melissa is an award-winning 6th grade English and global history teacher in NYC, and has been for the last 14 years. In class, they discuss many social issues on a regular basis such as gender inequalities, racial and religious prejudice and tolerance, animal rights, and other important issues. Melissa also started and directed a running camp for kids for 6 summers when YEA camp began. YEA Camp was, and continues to be, her inspiration. Mike has been one of our amazing, dedicated YEA Camp chefs for 5 years, taking great care of our community. Originally from Dayton, Ohio, Mike spent most of his life in in the Bay Area. He enjoys writing, being a personal trainer, and, of course, cooking. After Mike’s first summer with us, he promised to spend the next 5 summers with us, and, 5 years later, we are hoping for even more. Michael Starkey is a biologist, activist, and public speaker working to educate and involve the public in animal rights and wildlife conservation issues. He has a diverse background in the field of wildlife conservation and worked as an ecological consultant for environmental consulting firms and government agencies such as the U.S. Fish & Wildlife Service and the California Department of Fish & Wildlife. He has encountered a wide diversity of California wildlife in his work, including San Francisco gartersnakes, giant gartersnakes, California tiger salamanders, bats, and ringtails. He has also studied larval development and parental behavior of the neo-tropical frog, Leptodactylus insularum, at the Smithsonian Tropical Research Institute in Panama. He began working with the world’s leading amphibian conservation organization, SAVE THE FROGS!, in 2010 to inform the public about the threats facing amphibians, and has served as Chairman of the Advisory Committee. In this position, he rallied together scientists, volunteers, and others in order to help broaden SAVE THE FROGS’ mission of conservation. He co-founded Advocates For Snake Preservation, a nonprofit organization dedicated to snake conservation and continues to use his knowledge of snake ecology, positive attitude to inspire, and enthusiasm to engage the public with protecting these beautiful animals. Michael has given presentations around the world to inform the public about animal rights issues and to help nurture a society that respects and appreciates nature and wildlife. Michael currently lives and works in Belize, Central America. She has also served as the secretary of Hunter’s Women’s Rights Coalition for six continuous semesters and volunteered with the International Action Center in phone banking, advertising and organizing the annual May Day protests in NYC for workers’ and immigrant rights. Monica has worked with a non-profit called Girls Write Now, which serves to foster relationships between professional women writers and inner-city high school girls. Her passion for youth empowerment stems from her counselor position at Lead for Diversity, a week long program for high school students, where she facilitates large and small group workshops addressing issues of bigotry and prejudice. Some of her most recent ventures have been exploring sustainable modes of living, intentional communities and permaculture farming. Monica has worked at YEA Camp for the past three summers, and we hope she returns in the future. Nathan’s transformation from a privileged bully to an ally for humans and animals started in 2011. His curiosities led him to become a vegetarian and a Big Brother (Big Brother Big Sister) and he hasn’t looked back. Currently an undergraduate BSW student at Arizona State University, Nathan is involved in many student driven activities. His passions are steering him into the macro side of social work where he plans to make big changes with policies and legislation through research. One other passion that Nathan loves to talk about and act out is Hip Hop Pedagogy. Also defined as conscious Hip Hop, emcees rap about history and struggles in order to find the roots to positive change. Nathan came from Arizona to work at the California session of YEA Camp last year, and we hope to have him back in the future. Pierce Delahunt (they/them) holds an M.Ed. from the Institute for Humane Education. Their research was a study of activist-education programs throughout the country. Pierce has worked with Youth Empowered Action since 2014. They grew up in New York and New Jersey, and currently live in a eco-van traveling the country. Pierce sees their own work as the union of social-emotional learning and activist-education. They most focus on grassroots outreach and civic involvement, with training in nonviolent communication and empathetic listening. They work from the frame that individualist social-emotional learning is insufficient: Our capacity to have fulfilling lives and relationships cannot come at the expense of other communities’ abilities to do so. If our peace, love, light, and whole-child education movements do not address systemic injustice, then they are none of those things. Shelby has always wanted to make a difference but last summer as a camper at YEA Camp, the forces of the universe really confirmed that activism is her true calling. She’s so excited to be returning as a Counselor in Training! She just graduated from her high school in Los Angeles and will be going to Smith College in the fall. Shelby has been the co-president of her GSA for two years and is a strong voice for queer representation at her school. In addition, she has invested a lot of time into coordinating inter-school GSA events and creating a local network. She has also been leading a small club called Animal Allies for three years. Her main passions are animal rights, the environment, and queer rights, but she loves learning about and showing up for all issues of peace and equality (because they’re all connected)! She’s known at school as the rainbow-sock-wearing, reusable-plate-bringing, poster-taping, hiking-boots-wearing, optimist-kid. Shelby was a camper at age 17 and then has come back on staff for the past two summers as a counselor in training. We are thrilled to welcome Shelby back this summer for her fourth year in a row! From Minneapolis, Minnesota, Unny has been a camp counselor at YEA Camp for 2 summers. Unny has been involved in social justice organizing for 20 years for a variety of causes, but especially animals. Currently he is doing fundraising for CTUL, an organization that organizes low-income workers like janitors and fast food workers for better wages and working conditions. Immediately before this, he was the Executive Director of Compassionate Action for Animals. One of Unny’s favorite things to do as an activist is to build capacity, whether it’s raising funds or developing volunteer leaders. He has found it incredibly fulfilling to meet and build meaningful connections with fellow activists. Some favorite issues to organize around are challenging toxic masculinity, advocating for animals, anti-racism organizing, and transportation advocacy. He likes to meditate, spend time outside, exercise, swim, cross-country ski, commute and travel by bicycle, cook, spend time with friends. He is learning Spanish and speaks some Malayalam, his parents’ language. Xiao has been interested in educational inequality since attending Summer Bridge before her freshman year at UC San Diego. Ever since then, she has been a mentor, facilitator, and researcher for various groups on campus. Her passion lies working with disadvantaged and underrepresented students of color to overcome barriers that inhibit their success in education. She does so by teaching and researching for the Contemporary Issues class for Summer Bridge, which focuses on educational inequality with regards to classism, sexism, racism, and systematic oppression. Xiao was the Academic Coordinator at Monterey Peninsula College for the TRiO Math/Science Upward Bound program. This 4-week residential program that took place at UC Santa Cruz is designed to give high school students a glimpse into the college life. Xiao provided support and counseling (both one on one and group level) to these students in order to build confidence in them to achieve higher education. She is currently a graduate student at San Diego State University obtaining her Masters in Counseling with a concentration in Multicultural Community Counseling. Her internship is at Center for Community Counseling and Engagement, which provides low-cost counseling to clients with various mental health illnesses. Throughout her first year of graduate school, one of the few things Xiao has learned is the importance of personal development/awareness, mindfulness, and narratives as empowerment.